Although this photograph was taken in London, the bus had an important connection with Brighton. 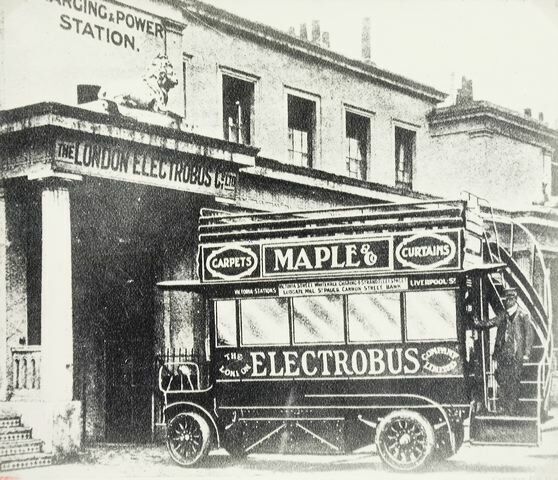 During the 1914-1918 war petrol was in very short supply for motor buses so six Electric Battery Buses were hired from the London Company and were used in Brighton from the autumn of 1916 until 11918. They were painted chocolate and cream. The colour of the Brighton, Hove & Preston Bus Company and a separate garage was set aside for their exclusive use at Montague Street, were the high amperage charging plant was installed. The buses completed two trips to and from Coleridge Street and then had their batteries changed. A gang of four men stood ready with the charged battery on the wheeled trolley and the bus reversed into position. One battery was released from the offside and the newly charged one was slid into position from the near side. The batteries were of the lead acid type and weighed about two tons. The buses had solid tyres on wooden wheels and had electric lighting. The seating capacity was in side ten on each side and twenty-two on top, a total of forty-two. Image Details: Original monochrome print.